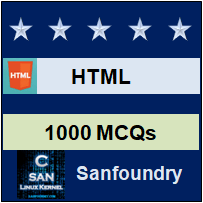 This set of HTML Multiple Choice Questions & Answers (MCQs) focuses on “HTML5 Audio”. 1. There is an audio format supported across all browsers. Explanation: There are 3 formats that are used in HTML5 Audio and are .mp3, .m4a AAC also known as H.264 format. 2. Which of the following tag is used for audio in HTML5? Explanation: <video> tag is used for video clips in HTML5. <canvas> is for graphical user interface. The audio tag defines sound, such as music or other audio streams. 3. Which tag is used to defines multiple media resources for media elements audio and video? Explanation: <video> tag is used for video clips in HTML5. <canvas> is for graphical user interface. The audio tag defines sound, such as music or other audio streams.defines multiple media resources for media elements, such as <video> and <audio>. 4. Which of the following browser does not support wav file format? Explanation: Opera, firefox, chrome and internet explorer are different kinds of browsers. Out of which audio file format named wav is not supported by internet explorer. 5. In HTML Audio/Video DOM __________ sets or returns the volume of the audio/video. Explanation: Src attribute gives current source of audio/video element. The videoTrack list is returned representing available video tracks by video track attribute. Volume attribute sets the current volume of video/audio. 6. Which of the following attribute adds audio controls, like play, pause, and volume? Explanation: The audio attribute defines sound, such as music or other audio streams. Source attribute defines multiple media resources for media elements, such as <video> and <audio>. Src attribute gives current source of audio/video element. The controls attribute is a boolean attribute. When present, it specifies that audio controls should be displayed. 7. In HTML Audio/Video DOM __________ sets or returns whether the audio/video should start playing as soon as it is loaded. Explanation: Control attribute is used to set whether audio/video should display controls. AudioTrack list representing audio tracks is set by audio track. The autoplay attribute is a boolean attribute. When present, the audio will automatically start playing as soon as it can do so without stopping. A current src of audio/video is returned by currentSrc. 8. In HTML Audio/Video DOM __________ sets or returns whether the audio/video should start over again when finished. Explanation: The loop attribute is a boolean attribute. When present, it specifies that the audio will start over again, every time it is finished. With autoplay, it ensures whether video/audio should play immediately after loading page. Seeking returns whether user is currently seeking video/audio. Timeranges representing played parts of audio/video is set by played attribute. 9. In HTML Audio/Video DOM __________ returns a MediaError object representing the error state of the audio/video. Explanation: Seeking returns whether user is currently seeking video/audio. Ended attribute fires up when current playing playlist is finished. The error property returns a MediaError object. The MediaError object has a code property containing the error state of the audio/video. The group to which audio/video belongs is returned by mediaGroup. 10. In HTML Audio/Video DOM __________ returns a TextTrackList object representing the available text tracks. Explanation: The current ready state of video/audio is set by readyState. StartDate sets current date representing current time offsets. VideoTrack returns video track list representing available video tracks. The textTracks property returns a TextTrackList object. The TextTrackList object represents the available text tracks for the audio/video. Each available text track is represented by an TextTrack Object.